The heir to Apocalypse is unleashed! The darkness erupting from the Archangel spells doom for all mankind! Only the boldest heroes can confront the crushing truth: to save the world they must destroy one of their own! This set is called "The Fall of Archangel," so we'd be fools not to start with him. That tiny blurb of text on the back of the box suggests the set is based on the story that ran through issues #8-19 of Uncanny X-Force, "The Dark Angel Saga." Being driven mad by the contamination that Apocalypse had introduced to his mind when the immortal mutant transformed him into his Horseman Death, Angel sought the help of ("Age of Apocalypse" refugee) Dark Beast to cure him. He took X-Force to the AoA universe, but stranded them there - by the time they got home, it was too late, and Archangel was trying to extinguish all life on Earth so he could start evolution over again. He'd raised a loyal army of former Apocalypse minions and hangers-on, which proved to be too tough for X-Force to handle alone. 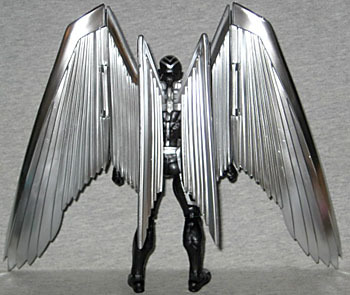 There's been a 6"-scaled Archangel before, but it's never been a cheap figure to get: it was rare when it was first released, and even rarer when it was re-released (in a worse paint scheme, so that might have been for the best). This set isn't doing anything to make him easier to get, but this same mold is scheduled for release in some unknown future series of ML. The figure uses the same body as ML2 Bucky Cap - like we said, that body seems to have been designed with re-use in mind, so it's nice to see something that isn't just a repainted Bullseye for a change. Warren is often shown as a small, slender fellow (since a big guy wouldn't be able to fly very well), but it's important to remember that he's always been a larger guy than Cyclops, and that part of his mutation involves hollow bones, so he's always lighter than he looks. The musculature here is a good size for the character, especially when he's all hopped up on goofballs evil. 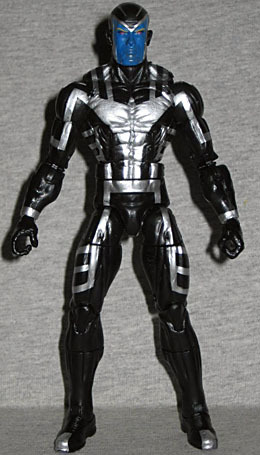 His costume is black and silver, and his face is dark blue. His eyes are red, and they even remembered to paint his blonde eyebrows. The look on his face is more threatening than the last figure, too. The star of the figure is the way Hasbro made his wings. They're separate, resting in their own discrete tray in the back of the box. Why are they separated from the rest of the set? Because they're massive. Even folded down, as they are, we're talking about a 10½" wingspan, and nearly 2" of extra depth added to the figure. They plug into Archangel's back, and are shaped to sit flush so they don't wiggle around. He can't spread the wings, per se, but they do get two points of articulation apiece: a swivel near the body, and a hinge in the middle. The wings look beautiful. The individual metal "feathers" have been sculpted as though they're hanging from a larger, supporting frame, the way it was drawn after Walt Simonson left the book and Warren no longer had segmented airplane wings hanging off his shoulders. They've been painted a lovely silver that looks perfect - just be careful, because it can scratch easily, and you don't want a marred Archangel, do you? Well, unless you're going to call it "battle damage" and pretend he's been in a fight. The idea behind Uncanny X-Force was that all the characters were all connected by the fact that they have been stained by evil in the past, have all been killers, and that definitely applies to Psylocke. She was originally a white British girl, but went through the Siege Perilous (the X-Men's mystical "get out of jail free" card) and wound up switching minds with Kwannon, a brain-dead Japanese woman who had been an assassin for the Hand. Not wanting to waste this opportunity, the Hand (with the help of the Mandarin) brainwashed Betsy into believing she was Kwannon, and put her back to work killing for hire. The last 6" Psylocke came out six years ago, so an update isn't an unwelcome proposition. That one was one of the best female Marvel Legends ToyBiz produced - but considering their output, that really isn't saying a whole lot. She was fine, but there's definitely room for improvement. Appropriately, this figure uses Hasbro's Elektra sculpt - since the only real difference between them (aside from the palette swap) is that Elektra wears a loincloth and bandana, and Psylocke doesn't. Other than that, they're both ninja assassins in cloth boots and swimsuits. Heck, the very first Elektra figure ever made? It was a repainted Psylocke. Turnabout is fair play. Her costume isn't really black - more of a dark, dark, navy blue. The color is only broken up by her skin and the gray sash around her waist. 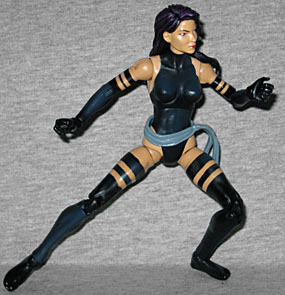 The biggest flaw with ToyBiz's Psylocke was her face: the only way she looked even a little bit Asian was if you put a "cauc" in front of it. Caucasian. She looked white, which she most certainly isn't. This one fixes that nicely. In fact, she now looks like Olivia Munn with purple hair. A very dark purple, but purple nonetheless. Psylocke gets the set's only accessory, unless you want to count Archangel's wings. Some comes with the same katana Elektra had, but it's cast in translucent pink plastic, because it's meant to be her a mental construct. They couldn't have given us her psychic blade, too? The one that's the focused totality of her psychic powers? She has that ability back now, you know. 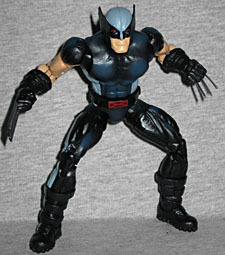 The final figure in this set is the real surprise: Wolverine. 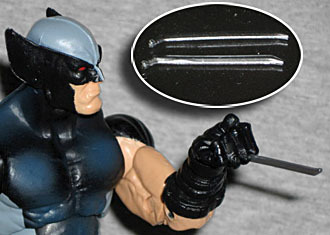 Now, it's not a surprise they'd include him - he was the black, pitiless heart of both the X-Force and Uncanny X-Force teams, and there's never been a company in history that didn't love making Wolverine figures. I think Mattel even slipped one in near the end of the DC line, when everybody had stopped paying attention. They called it "Combat Slash Batman" or something. Anyway, no, the surprise isn't that the set includes a Wolverine - it's that the Wolverine included in this set is the best one yet. Brown Costume Wolverine? Astonishing Wolverine? Move aside, boys, you've been usurped. 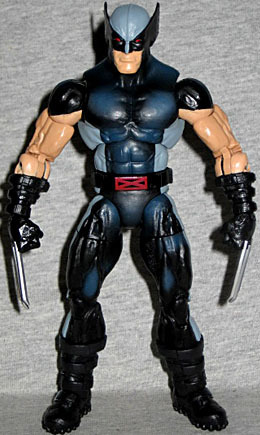 UXF Wolverine is wearing his X-Force uniform (which, remember, is not this) - the accents on the uniform are gray, not silver, so he doesn't quite blend with Archangel and Warpath. The figure is actually a mix of old and new: though the arms, legs and head are new, his trunk is actually the old "Brown Costume" mold! The details are a little bit softer, since it's an 8-year-old tool at this point, but it was good back then and it's good now. The only downside is that the legs now have a crisper level of detail than the torso they're poking out of, but it's something we can live with. His boots and gloves are thick and strappy, and he has a big red X logo on the buckle of his belt. The face is terrific. We've had lots of super-angry Wolverines over the years, but this is the first one that just looks annoyed. This is a Wolverine who just had his cigar slapped out of his mouth by some over-confident punk, and he's about to unleash on the fool - but not just yet. This face is about 30 seconds away from true anger, and it looks cool! 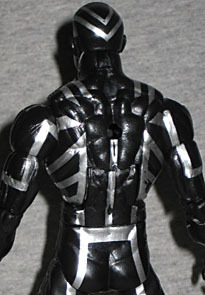 The old torso means old articulation - including the lateral hinge shoulders we barely ever see these days. The arms and legs get good Hasbro joints: swivel/hinge shoulders and hips, swivel biceps and thighs, double-hinged elbows and knees, swivel shins, and swivel/hinge wrists and ankles. The figure stands about 6" tall, which is much too big for a guy who's meant to be 5'3", but with all those joints you can have him squat and you'll never notice. Clever posing: another reason joints > no joints. 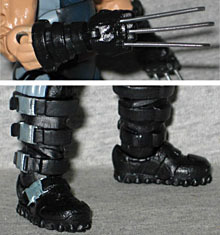 And now we come to the best part of this figure: his claws. 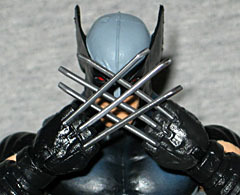 Remember how, with only a few exceptions, no one can ever manage to ship a Wolverine with straight claws? Well, this one finally does it. He has three separate, stiff claws on the back of each hand. And we mean separate: not "three claws that all join together when they reach the ports on the back of his gloves," three separate claws. Yeah, you read that right: removable claws. They're just held in place with a small drop of glue, so you can pull them out with just a little force. The only way you could ever do that before was if you customized your own. The claws are the thin razors they used to be before Marvel decided he needed to have bones inside them, with a little angle at the tip. 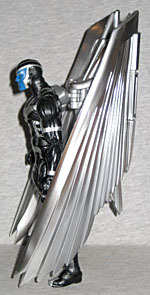 They're the same silver as Archangel's wings, proving you don't need to chrome things to make them look awesome. This three-pack is a really great exclusive - it's no surprise that it was one of the fastest sell-outs every day at SDCC. And then again on Hasbro's website after the show. Archangel is planned for a (non X-Force) repaint sometime in the future, but so far there's no word about Psylocke or Wolverine. And that's a shame, because all three of these figures are superb, and you should have the chance to own them at a reasonable price.